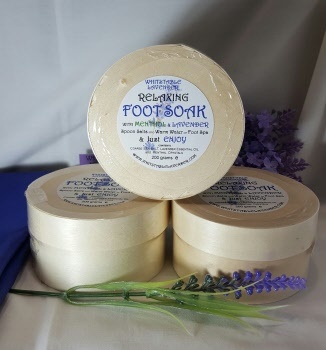 Lavender and Menthol Foot Soak - spoon some of these foot soak salts into Warm Water or Foot Spa & just enjoy. Contents - coarse sea salt, Lavender essential oil, Menthol crystals. Lavender Foot Soak - spoon some of these foot soak salts into Warm Water or Foot Spa & just enjoy.